Humanity is placing inordinate demands on nature, and it just keeps getting worse. In 2000, humanity had exceeded its "ecological budget" by October. This year, "Earth Overshoot Day" was August 13, according to the Global Footprint Network, a California-based environmental think tank. Earth Overshoot Day marks the moment "when humanity's annual demands on nature exceed what Earth can regenerate that year." This is yet another wake-up call that sustainable global development hasn't taken root despite two decades of effort. 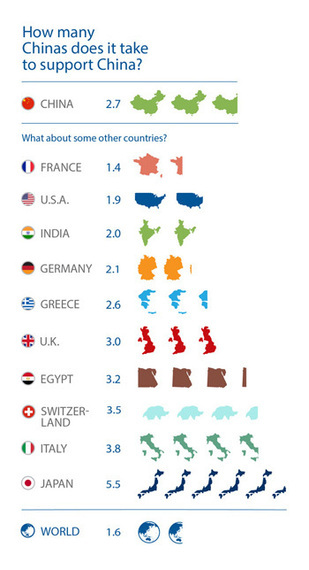 Humanity currently needs 1.6 Earths to cover what we take from nature each year. Global Footprint Network doesn't quantify how the accumulated deficits have impacted the long-term ecological health of the planet, but they say they are a cause for alarm. "It is not clear whether a sustained level of overuse is possible without significantly damaging long-term biocapacity, with consequent impacts on consumption and population growth." In other words, damaging Earth's long-term capacity to provide ecosystem services could result in lower levels of overall services, and that means fewer crops, fish, trees, and less fresh water. The biggest cause of the overshoot is, of course, skyrocketing carbon emissions, which demand that nature sequester carbon at far higher rates than is possible. The group says that carbon sequestration make up more than half of the total demand on nature. Other demands take the form of energy, fishing, timber and paper production, food and fiber, and settlements. Global Footprint Network includes settlements because they believe once land has been developed, its basic ecological functions have essentially been made "non-productive." While sustainable design practices can help make even developed land restore some its original ecological productivity, the group is largely correct because these practices are still not widespread. Estimates put the total share of green buildings worldwide at just a few percentage points, if that, and there is no data on worldwide sustainable designed landscapes. The costs of "ecological overspending" are also clear. As carbon dioxide levels exceed the Earth's absorptive capabilities, the excess enters the atmosphere, warming it. On the ground, the ongoing struggle between the expansion of human settlements and expanding agricultural production results in deforestation, soil erosion, biodiversity loss, and reductions in fresh water availability. Cropland, grazing land, and developed land all tax nature's ecological carrying capacity as they reduce its regenerative abilities. "All these demands compete for space. As more is being demanded for food and timber products, fewer productive areas are available to absorb carbon from fossil fuel." 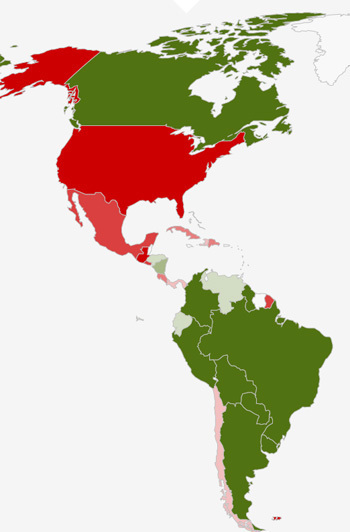 The think tank offers a smart interactive map that shows each country's per capita biocapacity alongside its ecological footprint, measured in global hectares (there's also an alphabetical list of all countries). Biocapacity per person is calculated each year based on a range of factors, including ecosystem management approaches; agricultural practices, including fertilizer use and irrigation; ecosystem degradation; population growth; and weather. 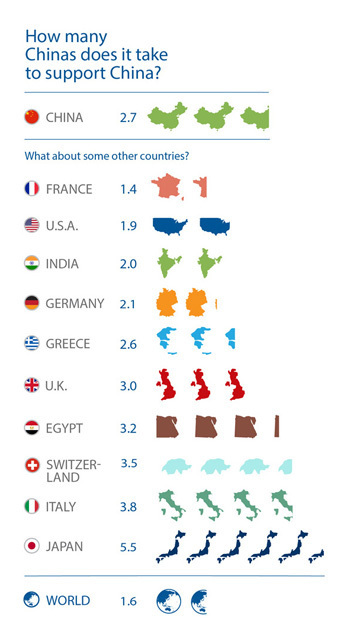 And ecological footprint per person is calculated according to the amounts being consumed and production efficiency standards. According to these charts, the biocapacity of the U.S. has been falling while the ecological footprint, with periodic jumps up and down, has largely held steady. But this really means that the deficit between the available biocapacity and the U.S.'s ecological footprint is only growing. China's biocapacity has largely held steady, while it's ecological footprint has exploded beginning around 2000, only expanding the gap. Japan now requires 5.5 Japans to support one actual Japan each year: Its biocapacity continues to shrink while its ecological footprint has only increased. But, interestingly, with the fall of the Soviet Union, Russia's biocapacity has actually grown dramatically -- one of the few positive environment outcomes from that oil and gas exporter -- while its ecological footprint shrank but is now creeping up again. 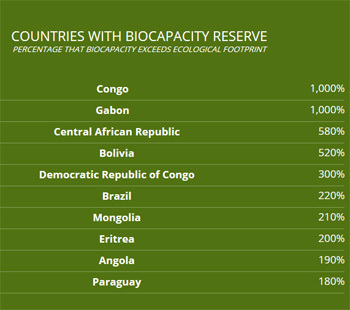 As part of the interactive map, the organization lists all the countries that are a "biocapacity reserve," meaning they produce materials and consume resources far below the levels that tax nature's abilities. These are mostly developing countries in Africa, South America, and the Middle East, along with developing countries with huge environmental bounties like Brazil. 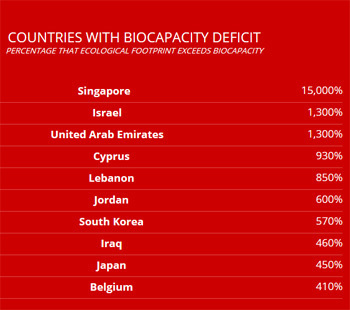 And then, also the countries that have biocapacity deficits, meaning they consume and produce far more than their natural environments can sustain. These countries are wealthy, urbanized countries like Singapore, Japan, and Israel. These compelling tools demonstrate what many environmentalist believe -- that the Earth's ledger is out of balance. As the famed biologist E.O. Wilson wrote in The Future of Life, one of his best books, "the constraints of the biosphere are fixed." This means that either the earth's biocapacity needs to be increased, or human consumption and production need to be decreased to reach a sustainable balance. Already, the Earth has 7 billion people, with the numbers just growing each year. E.O. Wilson and other scientists have pointed to the number 10 billion as the ultimate maximum capacity. While techno-utopians believe there will be a new green revolution that will only increase the productivity of agriculture, what about the never-ending growth of grazing animals? They are not ecological assets. Wilson argues that "if everyone agreed to become vegetarian, leaving little or nothing for livestock, the present 1.4 billion hectares of arable land (3.5 billion acres) would support about 10 billion people." And what about forests? What new approaches can increase forests' capacity beyond a commitment to protecting them and planting more trees? A new special report in Science argues that the world's major forest biomes are struggling despite the best efforts of dedicated forestry officials around the world. Global Footprint Network experts see the rise of renewable energy sources like wind and solar as one of the most positive steps in helping to keep every country in its ecological budget. Explore the interactive map and learn more at Global Footprint Network.